Police who arrested The Joker want you to come and get your face painted! The police force who arrested a man for wearing make-up are inviting your kids to come and get their faces painted this Halloween! 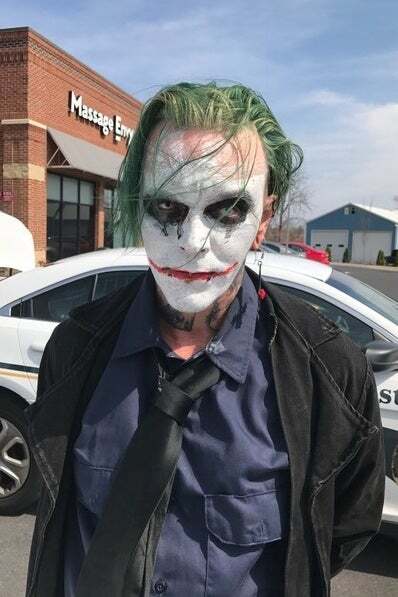 Back in April, there was a quick global buzz over a report from police in Winchester, Virginia who had arrested a guy dressed as The Joker. He was alleged to be carrying a sword. Here on the other side of the planet it seemed really strange that they didn’t charge him for carrying an offensive weapon. But they did charge him with wearing make up. Pictures emerged of the accused, a Jeremy Putman, having been arrested outside a massage parlour (part of a chain that seems to specialise in, ahem, extra services). So I’m thinking this is some kind of puritan vigilante action and disaster has been averted. Except they’ve arrested him for wearing make up (and to be fair, Winchester, Virginia does have an ordnance against wearing masks which was a response to the Klan). Also, while reports mentioned Putman had been detained at the Northwestern Regional Adult Detention Center, they didn’t mention that bail had been paid and he was released the same day. What about that sword? The arraignment on April 10th went to a continuation and the case was finalised on August 9th when it was dismissed. no charge, no sentence, no probation, no fine! So what was it all about? None of the press outlets who covered the initial arrest seem to have discharged their responsibility to follow things to the close? Meanwhile, Winchester PD and their Fire Department friends are celebrating Halloween with a spot of face painting. Now that’s got to be an easy pinch, if I have ever seen one! Fireman Sam can put on the tiger faces, McGruff the Crime Dog can wait round the corner and slap on the cuffs as the kids head home. The Winchester Police Department and the Winchester Fire and Rescue Department will once again host the Public Safety Trunk-or-Treat on Monday, October 30 from 6:00-8:00 p.m. at the Shawnee Fire Department (2110 Valor Drive). Bring your children to check out the fire truck and police cruiser displays, have their faces painted, meet McGruff the Crime Dog, win prizes, and stock up on candy.